In addition to showing of some features of the Windows 10, Microsoft has also revealed a new component of Windows 10: Windows Holographic, a version of its OS built for an augmented reality headset called the HoloLens. Microsoft claims that Windows 10 is the world’s first holographic computing platform complete with a set of APIs that enable developers to create holographic experiences in the real world. With Windows 10, holograms are Windows universal apps and Windows universal apps can work as holograms, making it possible to place three-dimensional holograms in the world around you to communicate, create and explore in a manner that is far more personal and human. The HoloLens is the world’s first untethered holographic computer that does not need any wires, phones or connection to a PC. Microsoft HoloLens allows you to view holograms in high definition and hear them in surround sound, even if they are behind you. It has its own CPU, and GPU, plus a new ‘Holographic Processing Unit’ designed specifically for this new kind of computing. Thanks to its advanced sensors, Microsoft HoloLens can see what you are looking at and understand what you are communicating with your hands and voice. 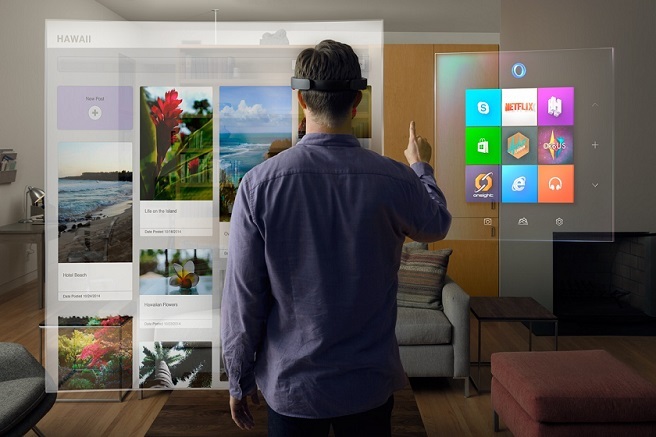 The HoloLens is somewhat similar to Google Glass and Samsung’s Gear VR.